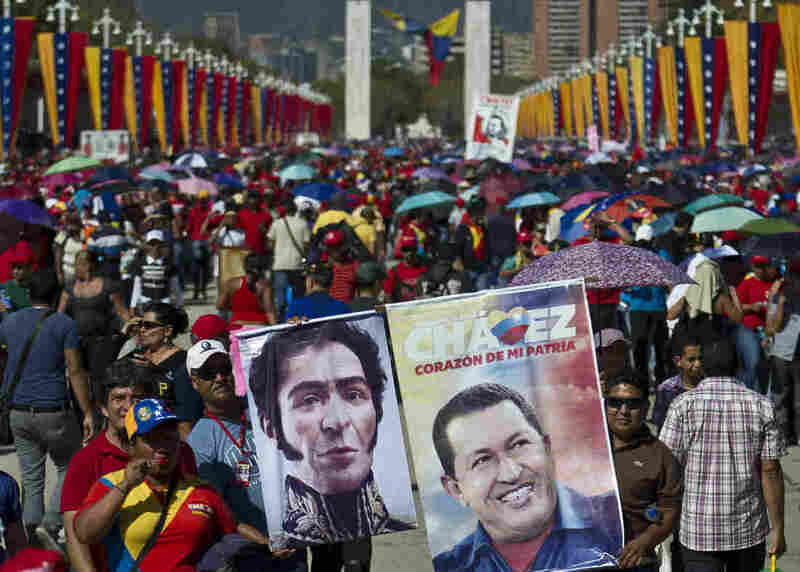 Venezuela's Acting President Says Chávez's Body Will Be Permanently Displayed : The Two-Way Chávez's remains will be displayed at the Museum of the Revolution, near the presidential palace. Supporters line up to pay their last respects to late Venezuelan President Hugo Chavez, outside the Military Academy in Caracas on Thursday. The mourning over the death of Venezuelan President Hugo Chávez took a Lenin-eque turn today: Acting President Nicolas Maduro announced that his remains will be on permanent display at the Museum of the Revolution, "close to the presidential palace where Chavez ruled for 14 years," the AP reports. "Maduro says the president will lie in state first for at least another seven days. "A state funeral for Chávez attended by some 33 heads of government is scheduled to begin Friday morning. Tens of thousands have already filed past his glass-topped casket at a military academy following a seven-hour procession on Tuesday which took his body from the hospital where he died." We wrote a post about that procession on Tuesday.